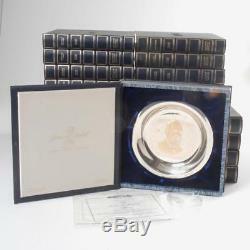 A set of 25 Sterling silver and inlaid 24KT gold Presidential plates by Franklin Mint with presentation boxes and Certificates of Authenticity. Each plate and COA Comes with the same serial number 1878. The certification dates on the COA's ranges from 1972 to 1976. The consists of all Presidents from Washington to Theodore Roosevelt excluding John Quincy Adams. The set additionally includes Gerald Ford. The Martin Van Buren set is missing its COA, but the 1878 serial number is on the back of the plate. The gilt detail on the box for William Henry Harrison is faded. The plates are all approximately 8 in diameter. The plates range in weight from approximately 163 to 196 grams each. Each box measures approximately 10.25" by 10.25" by 1.75. Visit our store to see our complete selection of offerings from several categories including antiques, jewelry & handbags, sterling silver, porcelain, and more. Get Supersized Images & Free Image Hosting. Attention Sellers - Get Templates Image Hosting, Scheduling at Auctiva. The item "SET OF 25 FRANKLIN MINT STERLING SILVER PRESIDENTIAL PLATES With BOXES & COA" is in sale since Thursday, September 6, 2018. This item is in the category "Antiques\Silver\Sterling Silver (. The seller is "whiteroomauction" and is located in Boonton, New Jersey. This item can be shipped worldwide.